It's done. After three and a half weeks, I am finally done with Don Quixote. Those who read my review of the proceeding parts will be well aware that I did not like it, considering it an exercise in horror and poor attempts at humour. Did I fare any better in these parts? Parts 4 & 5 continue the adventures of Don Quixote and Sancho Panza as they travel across the country in search of wrongs to right. And while most of the problems that were present in the previous parts are still here in force, I will admit that these parts are more enjoyable. So, I shall get the negative out of the way first. It's still asking you to laugh at the plight of a mentally ill man. Not only that, in Part 5, when Don Quixote's adventures from the preceding parts have become widely known to people, there are those that would purposely create false scenarios designed to trick and humiliate said mentally ill old man and his idiot squire. The jokes become more deliberately cruel, as opposed to merely absurd with a cruel streak. I still can't get behind that. Now for the positive. It actually contained some really interesting side characters and stories, such as "The Curious Impertinent" which is the source of the term lothario. These side stories are perhaps your more traditional courtly romance kind of story, but they make a nice change from the aforementioned cruelty. 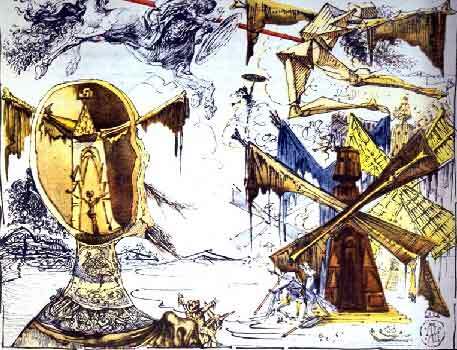 The other thing that I liked was that Don Quixote actually seemed to get better as he went along. While he was still convinced of knight-errantry and enchantments, he began to see things as they really were and was ready and willing to compensate the people who he had inadvertently wronged. It was refreshing to see him confront the consequences of his actions, considering some of the harm he had wrought before. Next review: Narcissus and Goldmund by Hermann Hesse.